Keeping a few electrical tools and supplies together in a toolkit makes DIY wiring easy. I’m no electrician, but it seems like I’m always tackling some minor electrical project around the house – from installing a new ceiling fan or dimmer switch to upgrading a bathroom sconce or kitchen task light. After hours spent searching through drawers for the right tool or part, I came up with an inexpensive electrical toolkit to make all my wiring projects a breeze! Wire Strippers ($15 to $20): A good pair of wire strippers should include a stripping gauge (for removing wire insulation) that fits all the major types and sizes of wire, plus integrated wire cutters, and a needle-nosed pliers type tip for bending the end of wire. 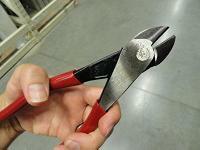 For many DIY jobs, this is the only pair of pliers you’ll need. They’re lightweight and great for detail work. Wire Cutters ($20): A sturdy pair of wire cutters will save the day when dealing with tough, hard-to-cut wire insulation found in older homes. Most light electrical jobs don’t require a lot of wire cutting, but sometimes you need to cut off a frayed end or strip back some insulation to give you more slack. 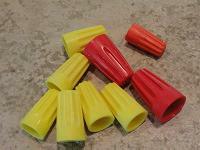 Look for a fairly large pair with insulated handles that can take on a variety of wire thicknesses. 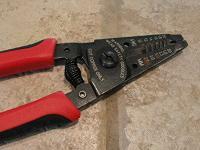 Voltage Tester ($10): A noncontact voltage tester is an invaluable tool to see if current is running through a wire. Even though I turn off the breaker, I still double-check with a voltage tester before cutting or working on a wire, in case there’s more than one circuit connected to the box. A voltage tester is also great for troubleshooting when something isn’t working right. Screwdrivers ($10 or less): You’ll need both slotted and Phillips head screwdrivers (or a screwdriver with interchangeable bits) for electrical work. 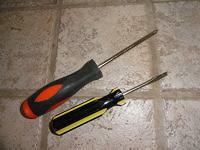 A light-duty, inexpensive screwdriver set will do just fine for DIY electrical jobs. Insulated screwdrivers (which don’t conduct electricity) are available, but if you’re careful to use your voltage tester, you shouldn’t need them! Fish Tape ($10 and up, optional): A fish tape is only necessary if you’ve taken on an ambitious electrical project that involves pulling or “fishing” wires through walls. The stiff tape is inserted in the wall and out the other end to help guide the wire through. 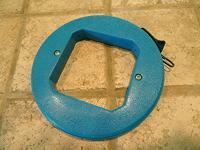 A fish tape isn’t required for simple jobs, like replacing an outlet; but if you ever need one, you’ll really need it! 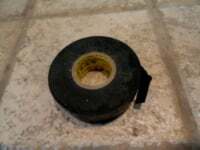 Electrical Tape ($3/roll): This stretchy black tape can be used to repair minor nicks in wires, to mark wires for various purposes, and to cover and insulate wire nut connections. Electrical tape also comes in a range of colors for use in marking and distinguishing between wires. 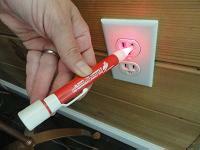 You can also use brightly colored electrical tapes to mark your tools so no one walks off with them. Wire Nuts ($2/package): Your electrical toolkit also needs an assortment of wire nuts in various sizes to screw onto the connections of different size wires. Many light fixtures come with wire nuts, but depending on the gauge of your home’s wiring, they may not be the proper size to fit. Having extras on hand in a variety of sizes will save a trip to the hardware store if you come up short. Mounting Screws ($1/package): You also need a collection of screws for mounting switches, receptacles, and light fixtures to the electrical box. While fixtures, switches, and outlets often come with mounting screws, they are often too long or short to fit the electrical box. No more rummaging in the garage for spare screws! 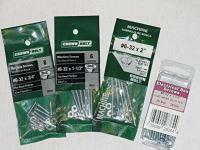 Look for #6-32 machine screws, and buy a variety of lengths. Face Plate Screws ($4/package): It also wouldn’t hurt to pick up a package of mounting screws for cover plates, in case you lose one. They are also sized #6-32, but they’re usually specially packaged with rounded heads in white, steel, or brass to match your decorative face plates. 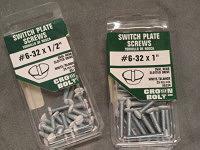 You can also buy an Electrician’s Screw Kit that includes an assortment of face plate and mounting screws ($10). 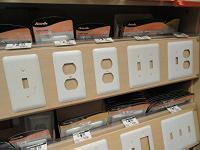 Cover Plates ($1 or more each): When replacing wall cover plates (face plates) on switches and receptacles (outlets), go ahead and buy a few extra while you’re at it for future repairs. As I’ve discovered on more than one occasion, even the so-called “unbreakable” cover plates are pretty easy to break, and it can be hard to find a match down the road! 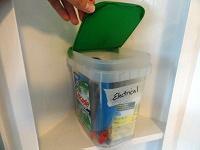 Container ($0 to $20): The container for your electrical toolkit can be anything from a reused or recycled bucket to a fancy tool box or tool belt. I used an empty dishwasher detergent tub, which has a hinged lid that easily stacks on the shelf where I can find it. To make it easy to spot, I labeled my electrical toolkit with a highbrow piece of masking tape! Having moved into a new home I can see the importance of having a DIY electricians toolkit. I like to do repairs myself to gain handyman skills when I can, so this should help facilitate it perfectly. I’ll have to save this page the next time I’m at the hardware store to pick up the right electrical supplies. Thanks for your post.